Antiques & Fine China Collectibles Query - CROWN MARK AND POMPEYI MARK:- I recently purchased an item described as an ANTIQUE ENGLISH MAJOLICA VASE - POMPEYI DESIGN. I purchased the item aware that it may not be authentic, and I am happy with the piece even if it isn't authentic, but my curiosity has gotten the better of me. The base contains a mark. It is an encircled crown with some kind of flourish at the bottom of the circle and POMPEYI printed at the top. I'm attaching two images, including one of the mark. Can you tell me which manufacturer used this mark? Many thanks for submitting, and hope you are finding the site useful. Now, as I keep saying, I am not an expert, just a worker in the china industry, but I do have a 'nose', and I like to have fun with antiques and collectibles. Whatsmore, I am learning more everyday because of interesting queries like this one - which very much gets my 'nose' twitching. Well, I feel like there is a big story behind this one. There are certain things about this piece make me want to look closer. If I were to see this at a garage sale or a thrift store (Charity shop if in the UK), I would snap it up in a second with a view to finding out more about it. I would be quite prepared to take it to an expert and be told: "This is nothing, your imagination is running riot". However, I would buy it and take the chance, as I think the design is very cool and goes along with today's tastes. So what intrigues me is the fabulous design for a start. I like bejewelled, I like the reticulated trellis work. I like the hand-made, almost naive or folk art look on the item but what seems a very solid looking, well designed, presented and executed manufacturers stamp. These two things together are incongruous, and get my attention. The solo crown mark without initials is the worst possible to identify as so many hundreds of makers used a crown. Most better known makers almost always put initials or some other distinguishing mark to further identify their wares. This mark does not have any words apart from "Pompeyi", which I feel is a reference to the shape or pattern, or range rather than the maker. makers garter mark (like the order of the garter on the Royal emblems). 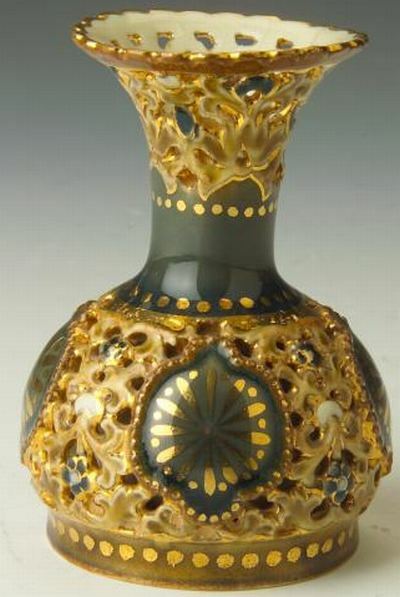 I look it up online and there isn't much around, but see Worthpoint are selling two matching majolica bottles obviously made by the same company in the same period. The Worthpoint vendor also doesn't know who this is either - just describing them as "...early English majolica... bottles feature little button-like rosettes on the outside and have a handmade feel. They are signed "Pompeyi" on the base with a crown mark." The plot thickens, I want to know more, my nose is twitching even more now! Hmmmm... "Early English" is obviously more valuable than "Made last week in Taiwan"
I can find nothing else online. Then, by some accident, my nose brings me to the subject of Pratt Ware or Prattware - a highly specialized collecting area which I know nothing at all about, but by all accounts is quite sought after. The attractive and colorful cream-tinted earthenware jugs and mugs with relief decoration have long been known as Pratt ware, although they were also made elsewhere in Staffordshire, as well as at Leeds, Castleford, and several other potteries. It looks like the finest old Italian majolica apparently. I then looked at the marks of F & R Pratt as many of the original Felix Pratt wares are unmarked. I did not find your mark, but I found a mark showing a similar crown to the one shown above, but without the knotted belt circle device around it and with the words "F & R Pratt & Co Ltd Fenton Manufacturer to HRH Prince Albert". This mark dated from 1847 - 1860. So is your item paying homage to a mix of old references? The answer to the above questions are, I simply don't know, but would love to find out. Any knowledgeable contributors who feel thay may be able to help with this one please post in the comments section below. Kathi, many thanks for taking the trouble to upload such an interesting submission and nice photos, and I hope we can get this resolved soonest. Thank you very much for your input. I would love to see a picture of your pot if you figure out how to upload it. Just at the moment only the original submitter can upload pics. p.s. the Pompeyi might mean the 'pattern' - i.e. the bejewelled majolica collection of that particular manufacturer. 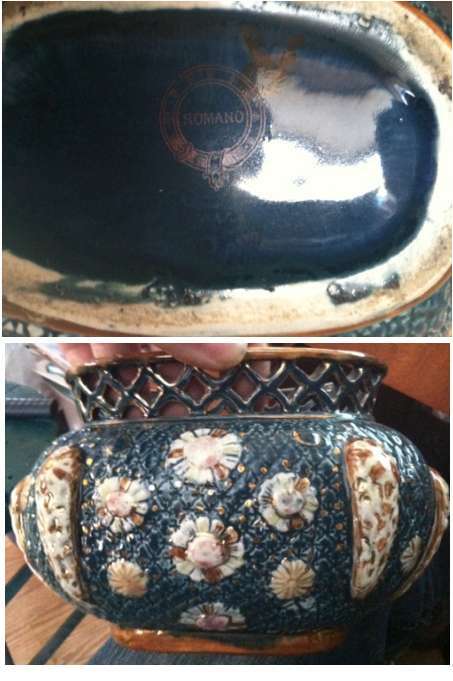 We got some interesting news to report on this issue of the Garter & Crown mark on old looking majolica wares. There is a school of thought that these items are from modern (21st century) Chinese production - similar to the intricate and deliberately aged wares of the 'Wong Lee' factory. Here are some photos from Arline who kindly did some research on our behalf on this subject. See how the base has been deliberately aged to look like Victorian majolica. No wonder my nose was twitching! Much too good for Wong Lee or similar. This is probably a Minton mark mid to late 19thC.Read about this type of ware in the "Minton Bible" by Atterbury - "Pompey ware". Pompeiian ware have this embossed surface - just for inf. Hello i would like to add my knowledge of Pompeyi. I purchased 2 rather large identical Pompeyi vases several years ago. I had them valued by Christies auction house, as when i emailed the photo's of them, they too initially thought they were English majolica, and were obviously keen to see them as they would have worth a bomb. However upon Christies seeing them they advised me that they were not infact English but Hungarian Pecs 1890's, and worth around £300 - £400. Not sure if this is true, but If you look up Zsolonay some of the works are very similar in style, and still quite valuable. Serina, thanks for your remarks, this adds to the knowledge base here on the site. Who is to argue with Christies? But I somehow don't think the mark looks to be Hungarian in style somehow. I looked up Pecs Zsolnay ware and there wasn't a great deal of images online. What I saw was very high ceramic art, but none of it looked exactly like this Pompeyi ware and was clearly marked with the 5 tower pottery mark of Zsolnay Pecs. 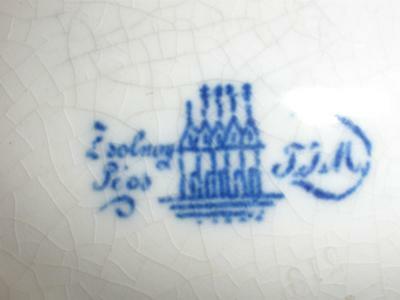 Above Reticulated Vase Made in Hungary 1880-90 with the standard Zsolnay Pecs 5 chimney tower (stamped in blue). 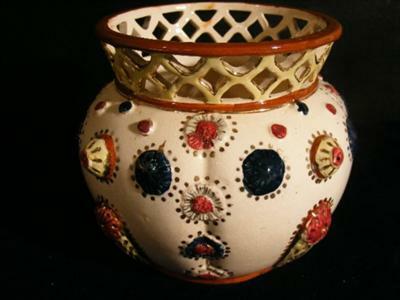 The above vase photo is shown courtesy of http://www.magyarkeramia.hu, who also have a very good history of the Zsolnay Pecs company along with many great photos of their wares. So we have one person saying 'English Minton', another saying, with some authority, 'modern fake', and Serina saying Zsolnay Pecs late 19thC - on the authority of Christies, no less. Don't forget the evidence of the first contributor, Kevin who assured us the same items had been "in my parents home for 50 years.... all around, identical to the original picture. I was told it was my great-great grandmothers. She would have been born about 1835". 50 years is the 1960's. Not proving 19th century at all. Despite Christies apparently saying otherwise, I don't think this Pompeyi majolica ware has anything to do with Zsolnay Pecs. Zsolnay were a multi award winning ceramicists of the highest order (look at the sophistication of the glaze above). Nice as the Pomeyi majolica is, it is far less sophisticated a product. 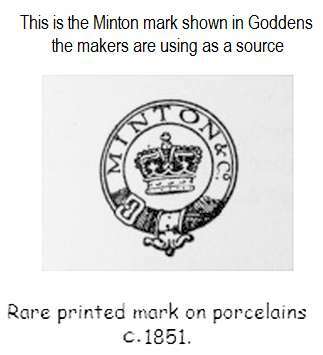 I have trawled through my Goddens encyclopaedia of marks for Minton and they are showing an almost identically designed mark for the year c. 1851 (much earlier) than Pecs. 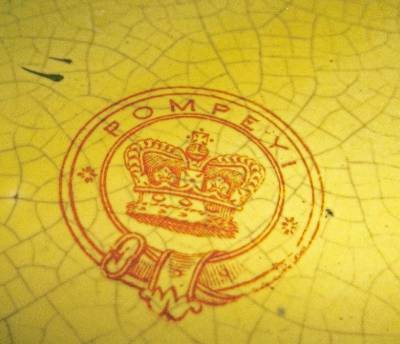 The only difference between the standard Minton mark shown in Goddens and the Pompey or Pompeyi mark above is that "Minton & co" is written above the crown, replacing the word Pompeyi. I don't know the colour or size of this marking as the reference an illustration in black and white. Somehow a large red Minton mark seems unlikely. Incidentally, some sources say that the word "majolica" was first coined in 1851 by Minton. Interesting! I was a collector of this stuff for many years and searched the world for it. I have 9 peices. Ive never been able to find out anything about them. Its delicious stuff and attracts many comments. I see there is one seemingly identical to yours on ebay right now. The seller is calling it "English". Hello Guys, just to give an update on your comments to my info, i am totally in agreement that Pompeyi are not Hungarian Pecs as i was originally told by Christies (see Peter's discussion above). I had taken my vases to my local Christies auction house - my vases do not have the red crown circle backstamp shown on the original photo above. One vase has a sword and a number 5 and some other letter/number? painted on it, and the other vase has a letter and number painted on it. It was only til i googled the style that i found other items stamped Pompeyi, and was also led to your site, where i shared what i had been told. Note that my vases should have the open work around the top, but this has been crudely cut off both before i bought them. I have sent photos to Peter who will hopefully upload them for your information, which may hopefully solve the mystery??. Thanks for sending these in Serina. Modern fakes or old Minton majolica?.... that is the question! From looking at these items - without the old Minton style mark, I can't think why Minton would not have marked their wares with the appropriate mark for the range and the period. It seems to me they were always very fastidious about the way they marked their wares. Why would they not mark their wares - they were a large and prestigious fine china firm on a par with Wedgwood, Worcester, Derby, Coalport, Doulton etc? However, Serina's marks do not look too much like what a modern Chinese firm would put on their wares if they were trying to fool us into thinking they were old. Seems to me they would be much more likely to put on the Minton style red circle and crown mark. Serina's marks seem so subtle they look to be genuine painters marks to me, rather than faker's marks? ....And why would anyone chop off the top reticulated fretwork? Complete madness! A lot of work to butcher a piece of ceramic - for what reason? However, this strange phenomenon might well suggest these vases have been around longer than a modern fake. Why would someone obtain these vases in modern times and then think it was a good idea to get technical with their buzz-saw? I don't think anyone nowadays would want to do such a thing - I can't think of any good reason to do this in today's world unless you are either mad, or have no sense, or no life. However, a person from a different era might have thought very differently to us (in a way it is impossible to fathom for us). They may have thought it a grand plan to customise an old majolica vase - taking great pains to cut off it's upper section in a crude manner. Perhaps they stood back, looked at their work (with their head to one side) and said "Ahh, now THAT'S better!" I am sure, in the end, Serina's photos will help us solve this one, but in the meantime, I am perhaps even more confused than I was before. Can anyone recognise the marks on Serina's vases? thankyou for adding my update and photo's. What a mystery this porcelain is !! Just to update you i believe someone probably dropped one of the vases years ago and damaged the fretwork beyond repair, so cut it off both vases, as i suppose years ago restoration would not have been very much heard of. Also i just found this interesting item of pottery, not the same style as our discussion on ebay which has a blue POMPEYI stamp in a garter but without the crown ?? Hope the info is useful. I have emailed a few museums too so if i get an answer i will forward it onto you. Thanks Serina. Let's see what the museum expert's say. The hand-made looking pink pouch thing on ebay looks far to home made to be anything Minton, but, you know, some very strange things were made in the name of art majolica in the early days - but not as far as I can see by Minton. The seller, interestingly says "SIGNS OF AGE AS SHOWN IN PHOTOS---Maybe some of the gold trim around the flowers is fading." Modern Chinese makers do the distressed look very well. I searched and found another of these item on ebay which had two rather deliberate looking chips and ageing on it. I notice a lot more of this stuff has appeared on the market since we uploaded the first post (do a Google image search and see - there was virtually nothing when I did this a while back). Maybe this is some big con, and maybe some conners have been posting here (owned by great-great-Grandma born in 1835? Kevin.... really, swear on your great-great-Grandma's grave). I just looked over 1400 auction sales of Minton Majolica over the past few years and there is nothing shown that remotely fits the bill to have the design and production values similar to this bejewelled majolica ware we area showing on this page. Minton majolica is without exception more 'sophisticated' than these items in terms of design and production. This majolica look very crude in comparison to Minton's. I don't think any genuine older firm would have played around with marks the way this range is playing around with it's markings. It's almost like some modern faker is saying "let's put the Pompeyi stamp on this run".... or "OK, lets put some painters type marks on this one".... "now we'll put the pompeyi mark, but not have the crown on this time". My nose is still twitching. Be interested to hear what the museums say. The first reply said: "the style is more associated with Hungarian potters such as Fischer of Budapest who were making wares influenced by Turkish pottery in the late 19th century. As such I am afraid they are of quite modest value at auction, maybe somewhere in the £100-200. region". Most grateful for you sharing this. I looked at Fischer ware from Hungary (see photos below). It may be modest in price, but it is very nice - actually too nice to be the maker of the mystery jewelled ware we showing above. Again, like Minton and Zsolnay Pecs, Fischer is much more finessed than our mystery ware. Similarly, Fischer tends to be very well marked (see below), so I can't see why they would make inferior wares, then mark them in a weird manner as to impersonate an old Staffordshire mark. This does not make sense on any level (unless it happened in more recent times under the communist production - when nothing in terms of business practice seemed to make sense). Below is a selection of the Fischer ware which is close top the Pompeyi ware shown above, only much better made. Our Pompeyi ware, is definitely influenced by the lovely wares of Fishcer of Budapest, but if made by them (which I am not convinced about), is a more modern version of their 19th century Turkish ranging. I am really coming round to the fact this is modern rip-off ware. Just look at the difference in quality between genuine Fischer and the Pompeyi ware. Serina, thanks for sharing this knowledge and getting this thread moving in the right direction. I just found this reference for a lovely Fischer teapot (see photos below). I don't know who made the more modern ones with the weird backstamps, but they are not as well made as these originals. Could Pompeyi ware being be what the apprentices of Fischer were making as they were learning. It seems a bit far fetched with the ornate back stamp. What do others think? would be nice to see your pompeyi items and marks. Send photo's to [email protected] and he will upload them for you. I think the theory two above could well be a good line of inquiry. It makes sense as the similarities in colour and style are strong !! Enlgish Minton Majolica? Hungarian Fischer? Modern Rip-offs? Many thanks to Benita Martin for sending in photos of her fine collection and adding greatly to this discussion thread. Red Pompeyi backtamp Jewelled ware. Is this English Majolica by Minton? Is this Hungarian ware by Fischer? There is something about this naive styling which appeals to the modern eye. I think although it has an old looking backstamp and the styling looks like 19th century Fischer, this is modern, not 19th century and below I will say why. Remember, I am not an expert, just a professional modeller and a collector of information. I was searching around (again) for this Pompeyi ware online and a seller on Worthpoint (seemingly unaware of its similarity to Fischer of Budapest's 19th Century Turkish influences wares) was absolutely adamant that this ware with the Pompeyi backstamp was 19th century English majolica - influenced by the excavations at Pompeii. The ware itself looks indeed like it could be crude old Staffordshire's attempts at majolica which comes out as 'folk art' - a bit like the Staffordshire flat-back figurines. Minton's majolica though was just too well made to be so 'naive' - they just couldn't help themselves. Any Victorian production manager producing wares as primitively finished as the Pompeyi ware shown above would have thrown himself off the Ironbridge in shame. I looked though 1400 listings of Minton majolica over the past few years sold at auction and none of it looked like this. 19th century Minton was simply better made and higher quality. Minton didn't make this style of wares but, it seems, Fischer of Budapest Hungary did. However, Fischer's 19th century examples (as can be seen above) are, again, much better quality than our examples - as can be seen from the photos above. Remember, production values then were a lot different to what they are now - the standards were higher. I don't think this is Far East modern rip off because the scribbled factory markings seem to be decidedly European. This would, perhaps, be a bridge too far in terms of deception by the Far East makers (although knowing how sophisticated Wong Lee are at making old European looking stuff, it could be a double bluff). It could be a modern range made in Europe and deliberately potted to look old and distressed. I think this is being done in Europe as well as China, but I don't have any threads on this site which highlight this yet (unlike Wong Lee rip-offs). 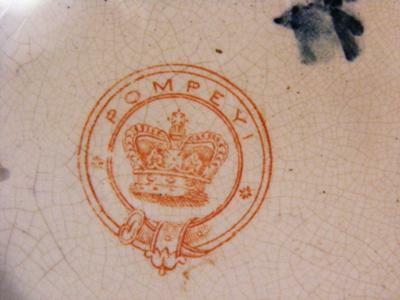 Looks like this Pompeyi mark was used by the Alhambrian Majolica pottery that was located in Staffordshire England. I realized Pompeyi was Spanish for Pompeii, which led me to Alhambrian, which used a Moorish style frequently. The garter mark is the same for both, so it appears this was our mystery maker! Is ALHAMBRIAN MAJOLICA (England) a made up modern fake name? I don't know why my hackles are rising, but the more I see of this attractive (to the modern eye) naive majolica with the old looking Staffordshire style markings (whether Pompeyi or ALHAMBRIAN), together with the slightly over-distressed finishing etc, the more I am of the opinion it's just modern production from clever people sourcing from China (people akin to fake specialists Wong Lee - who could be known respectfully as very tasteful reproduction specialists had they not put the spurious date of 1865 on their wares - together with a very English looking backstamp). Look on ebay, you will see a lot of this Alhambrian and or Pompeyi stuff around now - trying to sell for $70 - $100 USD (good profit on Far East stuff). Look on Staffordshire authority sites like potteries.org, you won't find any mention of this ALHAMBRIAN MAJOLICA (England) factory at all, look in Godden's encyclopaedia (the veritable bible of English pottery marks) and you won't find this so-called firm either. Are we trying to suggest this was a known factory which has just been overlooked by the greatest authorities on planet earth? Hmmm... possible but unlikely. If so please give details and citations. If so, how come so much of this stuff has so mysteriously started to appear on eBay and other online selling sites lately? A couple of years ago when this thread was new, I could find almost nothing of this stuff online. Gradually, more and more of this ware has been conjured up from somewhere. Obviously, there was a lot of long lost jewelled majolica in peoples' attics:? Until such time as we get evidence to the contrary I, for one, am presuming this stuff is modern fakery/reproduction - so BUYER BEWARE!!! We had another thread very similar to this one where the source of the fake old mark was in fact a modern (and very nice) Italian based website wholesaling beautiful reproductions (these people clearly designed the wares and old the looking stamp to go with it, and got it made out in the Far East where prices are much cheaper and quality is reasonable). There is nothing wrong with this in my book unless the wares then begins to be passed off by third parties (either through ignorance or deceit) as antique, rather than modern. BTW, sleuth, Pompeya is the Spanish for Pompeii, not Pompeyi. So you did totally amazing sleuthing to get that connection! The only non-selling reference to these wares online (apart from this site) is one paying membership marks site (that shall be nameless) which lists "ALHAMBRIAN MAJOLICA (England) - ca 1880s - 1910", but I think it may be possible they have been fooled into making this listing. I would write to them to ask, but I have found them quite difficult to work with in the past. I may be wrong, of course, but the lack of reference both on and off-line is very telling. A very interesting thread, thanks to all. Keep it going. Hi Peter, I made the original inquiry a couple of years ago and have found it fascinating to follow this discussion. I have to agree that the pottery appears to be strongly influenced by 19th century Fischer; however, I think you are probably correct in saying that it is a modern rip-off. I love my little piece, but I didn't pay much for it. I have a piece of this ware and here is my mark and the piece is yellowish cream color with the same decorations as everyone else and it look like the lace top was remove from mine as well. Just picked up this lovely little vase with a serpentine handle and the same POMPEYI embossed style and YES garter backstamp. Although it is mainly blue and not in cream and has heads and crosses on the embossing not flowers. When i googled majolica Romano a lot of similar pieces in style and pot came up. Thanks for the photos and adding greatly to this debate. I guess you mean the vase with the handle and the spout (otherwise known as pitcher or jug)? I am not sure what you mean by "is this the answer?". One of the listings stated the blue pompeyi style pot was made "by Romano Czechoslavakia". Note the misspelling of Czechoslovakia. No such company as far as I know. If you know different, please post. The word Romano seems more likely the colorway (blue). You must be using a different style of Google-Fu to me because when I did some searches, I definitely did not find very much at all similar to these pompeyi pots listed under "majolica Romano". Respect to your search expertise, please share this art with us so we too can find muchos majoloca romanos. The fact remains, the maker of these items seems terribly coy about coming straight out and admitting who they are - which is the usual state of affairs for Chinese and Japanese pottery and porcelain, but more unusual for European companies, unless they have something to hide (see above my photos of the very straightforward markings of Fischer of Budapest - who have nothing at all to hide). It seems convenient that the names of these pots keeps evolving. What is the first thing a potential buyer on eBay does? They look up the name. They find this page and realise the pot they like might not be as old a majolica item as they first thought. So the maker changes the name on the next batch for exports, so as to become invisible online once again. Now that's definitely Google-Fu! So while all these similar mystery items shown on this page are not exactly fakes, they may well be being tricksy and coy about who made them and where they actually originate from, because, frankly, there's a market on aBay for attractive pottery and porcelain that unsuspecting people might believe to be old English majolica or Fischer faience, or old Staffordshire, or Minton majolica. I saw this discussion, then, as chance would have it, I stumbled across a listing of the lighter color of these products (as seen above) with YET ANOTHER type of marking. It was a blue slash line with dots or smaller dashes either side - not the pompeyi, nor the old garter mark, nor the Romano brand - just a mysterious blue slash with two smaller slashes. As this website catches up with the scam and exposes the fake mark, they invent a new one, so the sellers can carry on the deception of this being 'old Majolica'. This jar was selling for nearly $40 - a good profit on something which would cost around $1 to make in a sweat shop. If this were an antique majolica mark, they would certainly not keep changing their minds about the marking, and they would not be suddenly flooding the market with (as Peter rightly says) a new generation of marks with each container load shipped over. To conclude - BUYER BEWARE! Many thanks to Peter for allowing us to discuss this issue. I know Peter is being more polite and less direct than me about it, but these are my strong personal views. Hello there,i found my way to your fascinating discussion forum when searching for information on a 'Antique nautilus vase Staffordshire Romano'. This was how it was presented on ebay on 27 Jan 2014. If you do a search you should still get original ad. Anyway, i had spotted this intriguing little vase and thought to myself i have got a few days to look into the mark. I have several of the more popular books including Godden's 'Bible'. Lots of similar garter type Staffordshire marks, but no 'Romano'. i thought i must be on to something here, because even the 'experts' are stumped. and on to Benita Martin's images of her vase with the exact same markings, although decorated in a different style, it slowly dawned on me i was looking at a very clever fake. So i decided, because i enjoyed reading all of the detective work involved in reaching the final conclusion, i must have my own little example. Sorry but I cant accept that these are fake at all. At least not a modern fake. They are quite obviously very old and from the late 1800s or early 1900s at earliest. One of the pieces I have was my nanas. She tells me that it was in the family home when she was a girl and was told it was old then. Apparently it was always crazed and it hasn't changed any in her life time. She was born in 1915 and only recently died. She seemed to think that they were Czechoslovakian or Hungarian. Her family travelled a lot. So.... Until someone comes along with more knowledge I think the case is still open. My father was born in Yorkshire in 1914 and inherited it from his Grandmother. I also have his Grandmother's old oak Stationery Box and Staffordshire Spill Vase. These were the only things he inherited from her. It makes me sad that people are deciding these are fakes. They are so cool and they are really antiques. just let me know how to do that. Just send the pics direct to me and I will post them here. i brought one of these today, backmark pompeyi over crown.This is not modern! this came from a 90yrs old womens house the handle had been off and put back on, i can see the old brown glue. no chance this is modern. There seems to be an influx of older people who bear witness to the age of these items and have owned this stuff since 1915. I think I might get hold of some of this Pompeyi ware (or Alhambrian, or ROMANO! or whatever the importers are calling it now) if it makes you live to 100 years old. There are Grannies crawling out of the woodwork holding pots of brown glue, thus proving this stuff is old, of course. OK, let's look at the physical evidence. What does fake crazing look like? 1. Crazing that wasn't there after firing (and wasn't meant to be there) but gradually appears after considerable time (100 years or so) due to environmental factors like temperature changes and moisture etc etc. 2. Crazing that appears immediately after the firing process, either on purpose or by accident. These two types of crazing (luckily) look very different. p.s. Of course when Peter (admin) and other posters are saying this stuff is likely modern production from the Far East, that doesn't mean to say it was made yesterday. Modern means it could be anything post WW2. In other words, not antique and not what it appears to be (crusty old Majolica with crusty old backstamps and creatively thought up old names). I can understand the concern over these after reading up on the Wah Lee/William Lowe controversy, but I know mine is 1880s as it was part of my father's inheritance and then to me. But proving this kind of thing is difficult I guess. It's educational to read all the comments though. Even the "experts" can be wrong. ps - Peter sorry I still don't understand how to send you a pic of mine unless I have an e-mail address to send to, but it looks the same as the others marked Pompeyi so maybe not necessary. I have one 9" pot with 2 cut out pattern handles,crudely decorated with some colour splashes under glaze.Base has rust coloured encircled crown mark with letter like an i in brown painted on top of crown circle. Also 2 jugs 7" high both with the encircled crown mark but one has number 2 in brown painted on top of circle mark. The glaze is badly crazes all over. The colour on the flowers is very varied. The gold decorative spots are worn away in places or missing. Crazing all over including handles. Nothing like the European pots which are finer. I found your thread by chance and become more puzzled. My pots like those of other contributers came from my grandmothers house and I'm 76 so they are not modern. Crude roughly made without fine attention to detail but attractive. I have been a ceramic specialist and dealer for 30 years. This was a small Staffordshire pottery active around C1890-1910 but for the life of me I cannot remember the name. I had on my old computer a full document on the pottery which has a group of followers. They used the garter mark with POMPEY ROMANO & HERCULANEUM to mention a few. They tried to give Staffordshire Majolica an Italian twist. The gold used is the bright painted on gold used for the above period. The pottery was called ?????? ?and ?????????. If I find it I will repost, but they deffo are not continental or fake. I have been doing my research, and this pottery is Staffordshire from the above company. It has been attributed to this company in the past, and being a long term dealer I have no reason to disbelieve this. They were made until 1954, and that is the reason there is so much about ( I picked up another piece today ). The gold used dates it to early C20th, The pottery was shut down in 1954, there is now a shopping centre where it was, but I am going to find out where the waster site was, and do some more research. Many thanks for your comments, very experienced you sound too, so really appreciate your contribution. 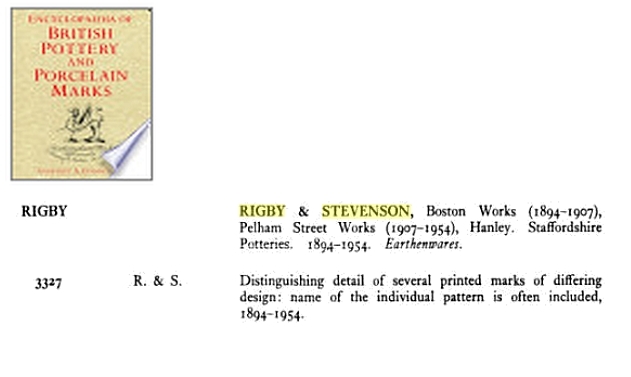 Before we go ahead and endorse your identification, however, we would need to see the details of the exact evidence which lead you believe these wares (labelled Pompeyi and Romano etc) have anything to do with Staffordshire makers Rigby & Stevenson. According to Goddens there has only ever been one mark ever attributed to Rigby & Stevenson. This is the R & S mark shown below (an extract from the actual Goddens book). Clearly, you have come across new evidence that adds to the catalogue, so please be so kind as to share it, as sadly, we can't just take your word at face value, we need a bit more detail in order to assuage the contributors above who believe these items to be modern exports made in China very recently. Majolica ware.....same mark as pompey but with the word Romano. Just adds to the mystery....I was told mine was old as well. Given to me by an old timer. Thanks for the pictures. Questions to ask in a situation like this:- How old is old? When and how did it come into their possession exactly? What is the provenance prior to that? The thing is, just because it is owned by an older person, it doesn’t mean to say it wasn’t bought in 1995. 20 years feels like a lifetime to us, but it’s a short period of time for a ceramic item. My own view is these items are modern and possibly still being made as we speak. The people online who swear by their age might be either mistaken, confusing 10 years with 100 or deliberately or trying to deceive. That doesn’t stop theses items being nice objects though – to our modern eyes. They are pretty, but poorly made. In the Victorian/Edwardian era they wouldn’t have been considered to have any value at all – you just have to look at pristine Minton majolica to see what look they liked. The constant change of brand name and the homage to (copying of) Hungarian Fischer are also big clues. Makers would normally want to build a brand, not constantly want to change it. I finally got round to posting the original Minton garter mark these people are copying. There is no record that I have come across of Minton using the Pompeyi/Romano/ etc versions. If you do have proof, it is important to publish it here. What a fascinating thread. I have two slightly different sized bottle vases identical to these wares. I bought them in a charity shop I was working in - they came out of a house clearance amongst other, clearly older items - nothing else of note I might add, mostly 70s cookware. 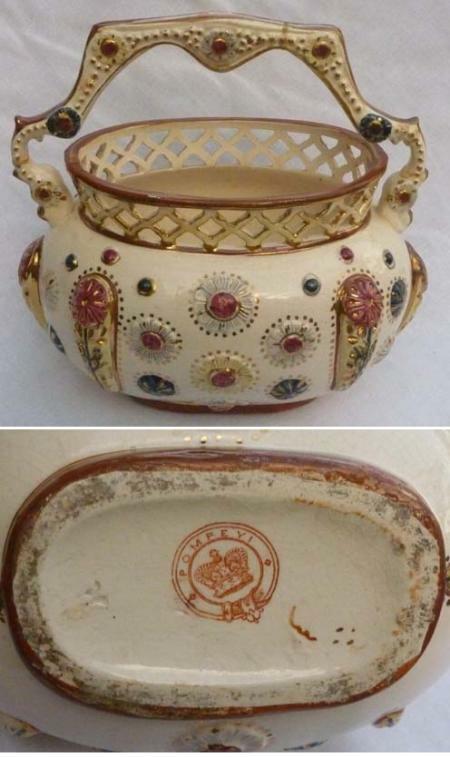 The makers marks underneath mention no names but are just two blobs in the burgundy glaze and a 4 and dash under it in gold on one and the other has a burgundy crown with three tiers ending in blobs and a gold H or N or zigzag. Weird that the two vases from the same house have different marks - I didn't get a sense the box of ceramics we received was full of someone into collecting. Thanks to the last poster. Wish we had your name. It is a fabulous post because it really gives us a sense of provenance and 'context', so we can go on a sleuthing rampage! Seeing more and more of these come to light, I have been going down the modern, still being produced in the Far East route. But hold on. This house you talk about was not about collecting stuff, or doing eBay bidding, or having a modern eye. It was an average English household, kind of stuck in the 1970's. Dusty, brown and slightly mildewed. We have had other people on this thread swearing they found these items in similar circumstances. I don' think this particular household would have had Victorian majolica around, judging by the other artifacts you mention. So these items must somehow have been around in the post war period, some kind of fashion for old majolica maybe. Maybe it was an influx of wares from Japan in the period they were exporting lots of mass produced ceramics pretending to be European? Were they gifts at old English funfairs in the 1950's and 60's? I just don't know about this stuff. The mystery is just deepening rather than being solved. feel free to send me the pics and I will upload them. Whenever there is an update it amazes me to see how many places/countries these pots have travelled to presumably with many of our relatives. I have a Vase that people are calling it Pompeyi but it has no mark on base other than numbers etched under glaze and gold number on top. It has blue glaze mixed in all over the base color of Fischer Budapest ink mark that I have seen. My vase has similar cutouts and color as the first small pot on top of this page but it also has more design and more gold highlights. The CRAZING is not Fake.The glaze is clear and will crackle when heated and was done when it was made yearssss ago.. I have an identified 1860's Fischer stamped Vase with same crackle glaze and same exact white clay pottery as the so called Pompeyi Vase I have. Chinese also intentionally made glazes with crazing in them in 1800's and earlier so you can not say they are not old just because you think crazing is Faked. I have another vase that is most likely ALHAMBRIAN MAJOLICA and is made of more a hard porcelain like photos shown of that type of ware,not white softer clay as these Pompeyi and Fischer pieces are. Christies seems to know more than most people. 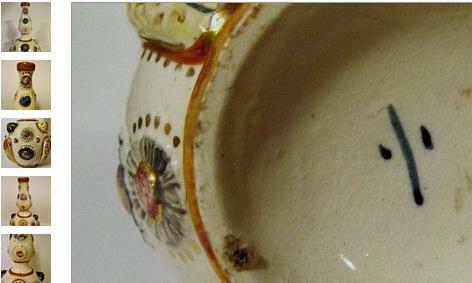 I am not going to call my items English or Chinese if they have same clay,glaze and design as old Hungarian pottery. To my eye, with the photos we see of real European porcelain in this thread, the difference is immediately apparent to the items marked Pompeyi or Alhambra etc. 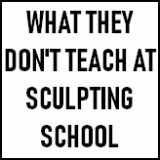 The bases are different, the body is different, the glaze and decor is different (better! ), the finish is more sophisticated, the quality is clear. So uploading a few pics will likely solve it. Pompeyi - new reproduction or old majolica? I inherited a bejeweled vase with the red, crowned symbol from my mother-in-law, who died this year at 92. She told me before she died when she and I were cleaning out her apartment so she could go into a care home that her aunt left it to her 50 years ago. She said her aunt likely bought it no later than the 1930s. It was a souvenir from a trip to Italy. My mother in law was clear-thinking to the end. What was funny is that she never liked it but kept it because her aunt loved it. I don't particularly like it either. But, at least for now, I am stuck with it. 50 years ago is around the mid 1960's. This is still considered 'modern' in antique terms. Just at the time when the Japanses were recreating English style marks on their export items which were flooding the west. So this fits the view that these are modern. History beyond this going back to the 1930's is conjecture rather than provenance and would need further evidence based information other than hearsay and guesswork. People tended not to travel abroad for trips to Europe in those days as there was no air transport and any 'trip' would have involved weeks of sea travel with limited amounts of space in luggage for fragile souvenirs as ceramics. Secondly, there is no precedent for Italian makers impersonating Victorian English marks, whereas there definitely is evidence for Japanese export wares 1960's and Chinese makers in the late 20th century and 21st century (currently) doing this. 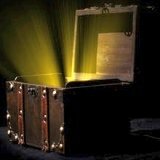 I am interested in the fact that we keep getting contributions which swear blind these wares are definitely old, definitely, definitely, no word of a lie, promise on Granny's honour . . . I would like some better evidence of provenance before I, for one, believe these are not either modern, in the sense of being 1960's Far East, or current production from China. To me, they really look like the latter. They have recently grown in number since first being written on this website about 8 years ago - as if they were burgeoning export wares from modern China. They have had lots of variations of marking which appear on the same objects, something very atypical of older items, but very typical of modern marketers trying to dodge the Google bullet. Sorry, Peter, that I seem to have offended you. I don't collect this stuff and I don't sell anything on Ebay. I have a 10-year dormant account with them and what I sold there was a carbon fiber touring bicycle. My mother-in-law, who died at 92 6 months ago, got this piece from her elderly aunt who reported buying it as a tourist chachka in Italy at Pompey. She was older and traveling in the 1920's-1930s. We still have her streamer trunks and well as those of my m-i-l's mother. The elderly aunt was actively traveling Europe and was my Canadian m-i-l's English aunt. I am not a collector of anything, except rescue dogs, and thought adding my m-i-l's words to this thread might actually be helpful in advancing the query. As a person with no interest in or knowledge of antiques perhaps that was naive of me. I did see items like this for sale at Ebay for $20-40 bucks with no takers. I wouldn't bother boxing and shipping something for that. It will go to a nice thrift shop soon along with other china chachkas my m-i-l inherited from her mother and aunts. By googling Pompeii I was directed to Ebay and your thread here. This is my second and last comment in your thread. You seem very suspicious. I sorry to have commented at all. Would like to send a pic if I could. On the contrary, I am really glad you posted. This is one of the oldest and most interesting (not to mention unsolved) threads on the whole website! I believe you. This is what I have been waiting for - provenance, detail and proper word of mouth evidence. Everything you posted rings true. Especially the fact that you were a bit upset by my quizzical approach and the only thing you collect is rescue dogs! LOL! Other people have also sworn blind their pots have been old and passed down, but I just wasn't sure what to believe. So, I think I believe these might be old style Italian souvenirs. Different regions might have asked for different backstamps from the makers - whoever they were. I have acquired an old majolica jardiniere and was trawling the internet in an attempt to find a similar item to enable me to research it. It looks very similar to the photos of the romano majolica and the mark looks similar to an etruscan majolica mark for 1875. It has lost all it's fretwork with the exception of it's stumpy foundation. I don't know how to upload a picture of it. It came in an auction lot. Hoping someone can help. Many thanks, Kathi. This is quite easy for someone to solve. Many of the pieces bear the registration no. 164675 which was for 1891. So it just needs someone to check the registration details and it will give you the name of whoever registered it. Correction! Not easy at all in my view. None of the items in question marked Pompeyi or any of the other spurious marks mentioned on this page, or any of the other examples I have ever seen (which is very many) bear the registration no. 164675. Not a single one. So not so easy after all. 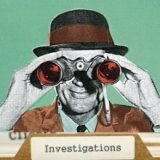 If you have evidence of what you state, please supply links to the images. I want to get this solved and a post like yours is not helping. Please try harder. I have myself just inherited one of these pieces. Its a tallish vase with the cut out band around the top. It belonged to my dad's mother before it was given to him. She was born around 1893 and the story of this vase was always that it was brought back from Italy by my dad's bother who himself would've been about 96 if he were still alive. My dad was 92 when he passed away this year and I have always known this vase to be in my family from when I was a small child. The markings on the Base are a gold V with a gold dot inside the V along with five dark brown dots arranged in a sort of triangle shape and also the number 1217 scratched into the actual 'clay'. We have tried for years to find out more about this vase but gave never had a conclusion. I also have a yellow vase with similar "raised" decorations, and the same crown with POMPEYI on it. My grandmother had it for many years and gave it to me when I was 10. I am 70 now. I sent pictures of it to a magazine many years ago, and was told it was Early Americana. I felt that explanation was rather weak, and would like to know more.